How do we know we’re moving the needle? How can we measure the value of a brand? How do brands become connected to a person’s identity? What exactly is a brand anyway? Is it a logo? A slogan? An experience? A dialogue? To answer these and other questions, I turned to my friend Dan Wallace, whom I’ve known for more than 20 years. Dan is the founder of Idea Food, a Twin Cities-based creative and brand consulting firm. Over those years, Dan and I have shared a number of conversations about branding as they relate to our careers in marketing and communications. Recently, Dan, and his friends, Aaron Keller, founder and managing principal of brand design firm Capsule, and Renée Marino, a brand appraiser with Cupitor Consulting LLC, collaborated and have published a new, must-read marketing classic, The Physics of Brand. Following its release, I interviewed Dan about some of the questions that I and others have been wrestling as we strive to master the art and science of branding. If you’d like to buy your own hardcopy version of The Physics of Brand, click here. DUPONT: Dan, how long have you been working in the advertising and marketing field? WALLACE: I started selling newspaper ads for my college newspaper, The State Press (Arizona State University), in 1980. My undergraduate degree was in marketing, with an advertising focus. DUPONT: Can you describe your business, Idea Food, and what you offer to clients? WALLACE: I work with clients to develop brand strategies and marketing plans. I also speak on brand innovation and lead workshops to improve the customer experience. DUPONT: What types of clients do you enjoy serving the most? WALLACE: My favorite clients are open to change and want to grow. DUPONT: What is the one thing that you do better than anything else? WALLACE: Others will have to be the judge of that. I’m intensely curious and want to understand how the world works. Toward that end, I ask insightful questions and organize my consulting engagements around carefully curated question sets. I have found that it is best to start by asking the questions you want to answer. DUPONT: One of your first jobs was working with the legendary advertising firm Fallon in the mid-1980s when it had just been named Agency of the Year. How did that experience affect the way you think about advertising and marketing and where you are now in your career? WALLACE: It was a heady time, and ultimately confusing. This was the last gasp of the Mad Men era. Like many people, the creative work and the shiny awards at Fallon dazzled me. Glitz aside, I thought advertising was about measurable results, and I found out that brand advertising effectiveness is almost impossible to measure. I also found out that the commercial mass media, and TV in particular, is designed to provide emotionally unstable readers and viewers in order to provide a desirable environment for advertising — this never felt right to me. I still admire the craft behind some advertising, but these days I’m an advocate for a customer experience focus and business model innovation. Our book, The Physics of Brand, presents a new theory of how brand value results from brands interacting with people in space and time. I’m fortunate that two early customer experience theorists who influenced my thinking, Joe PIne and Lou Carbone, are fellow Minnesotans. DUPONT: Who were or are your mentors? Is there any particular person who has influenced your thinking? WALLACE: I’ve learned from so many people and continue to do so. I learned about creative process and design from Brooke Kenny, Brad Norr and Michael Skjei; research from Simon Chadwick; entrepreneurship from Jeanne Voigt and Sunny Kwan; brand from Bruce Tait and Karl Speak; innovation from Robyn Waters and Joyce Wycoff, and the list goes on and on. I’m also a fan of learning from books, and many authors I’ve never met have influenced my thinking. DUPONT: Having known you for about 20 years, I know that you are voracious reader and traveler. What three books would recommend that I or any of our readers consider to gain insight about marketing, sales, branding or business in general? What about travel — is there any specific place that you find transforming? WALLACE: My three favorite marketing books are The Marketing Imagination, Kotler on Marketing, and Influence. My three favorite non-fiction books are Explaining Social Behavior, The Black Swan and Sapiens. I’ve become a big fan of Prague and Northern Bohemia, and I will be back there for work in February. The highlands of Ecuador blew my mind when I met tribal people who live much as they did 500 years ago. DUPONT: You have worked with some of the world’s most recognizable brands, such as Apple, 3M, IBM, Target and Microsoft. What have you learned in working with such brands and how have those experiences affected how you approach branding today? WALLACE: Big brands are fascinating. Customers spend massive amounts of time with legacy brands, leading to strong memories. This is a reservoir of potential energy. The challenge for legacy brand managers is to keep adding value to the customer experience and keep evolving the messages and signals they send out into the marketplace. DUPONT: In the preface of your new book, you and your co-authors speak of how you came up with the germ of an idea back in 2002 that would eventually lead to your book. How important is it to you to collaborate with others? You often work at CoCo, a co-working office space in Minneapolis. Have you found that helpful in developing the work product for your clients? WALLACE: The best work comes through collaboration, and even our solitary work product is the result of collaboration because the contents of our consciousness is there through others. All of the words we use came from others. CoCo has expanded my world, introducing me to people with very different skill sets, beliefs and desires. 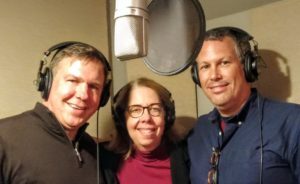 Dan Wallace, Renée Marino and Aaron Keller, authors of The Physics of Brand. Working with Aaron and Renée has probably been the most productive collaboration I’ve ever experienced. All three of us have different backgrounds, beliefs and desires. We continue to turn productive conflict into creativity every time we meet. DUPONT: You have worked as a solo marketing/branding strategist for most of your career (you’ve run your firm Idea Food for more than 16 years). What is it about that experience that you enjoy and what is it that you don’t like? WALLACE: Actually, I hardly ever work solo. Every project is a collaboration with other specialists and my clients. I like the variety of projects and partners. Independence is nourishing for a curious person with an independent mind. The downside of independent consulting is fluctuating workloads. DUPONT: Why do you do what you do? Do you feel called to your work? Do you dream of doing anything else? WALLACE: I have nurtured several entrepreneurial ventures throughout my career. One venture resulted in $1 million in sales to Fortune 500 firms and an award for internal branding innovation. Currently that venture is being pivoted. Another project is a new type of artwork with the purpose of helping people learn, create and grow at work, home and school — and I do feel called to do this. I also have some conceptual art concepts that I’d like to produce in old age. I like the freedom to learn, create and grow. DUPONT: Your new book is based on the premise of “micro-interactions between people and brands as they move through time and space.” When I hear this, I think of the “butterfly affect.” How does every interaction that a consumer has with a brand affect the brand? How do those thousands or millions (think of Facebook or iPhones) interactions affect how companies shape their brands? WALLACE: Those micro-interactions are dominated by customers’ use of the actual branded products and services. It’s way more than messages. Micro-interactions are every signal that is sent by the brand owner, whether these signals are consciously intended or not. We cannot not communicate. Everything communicates. DUPONT: How do brands such as Coke, Apple, Facebook (and other well-known brands) affect the personal identity of a consumer? For example, many people associate themselves with a team such as the Minnesota Vikings or claim, “I’m a Chevy guy.” When someone so embraces a brand in these manners, is that the pinnacle of branding? WALLACE: When people see themselves as being part of a community that supports a brand, that is about as good as it gets for a brand owner. The challenge is to nourish that community and keep adding new value to the customer experience across time and space. One of the best ways to add value is to save a customers’ time and improve the quality of that time. Our research also shows that memories are enhanced through experiences that are time immersive, multi-sensory, social and personally meaningful. DUPONT: In your book, you and your co-authors note, “We need a renewed empathy for the human being, not as consumer, audience or segment, but as a person.” How can marketers make their brands more human — more authentic to the human experience? WALLACE: Back in the 1800s people who bought from you were called customers and treated like guests in your home. After World War II, these same people were renamed consumers and treated like targets on a firing range. This change was all part of a concerted effort by the U.S. government and industry to develop a consumption-based society. This effort to increase consumption worked, but today our world is very different from the 1950s, and we need to return to the values and language of the 1800s. Brand owners can no longer control the medium or the message. Customers now have instant access to online communities that rate brands and guide purchase decisions. Over time, the power has moved from the manufacturer, to brands, to retailers to you and I. We the people have more power than ever before when it comes to brands. The tables have turned. DUPONT: In your book, you, Aaron and Renee note, “trust in the people behind the brand is baked right into the culture and becomes a binding thread in all that they do to offer responsibly designed, manufactured, and delivered products to the planet. A brand designed for the people and the planet.” In this section, Patagonia is held out as a brand that is achieving this. By this, do you mean that marketers have to stop thinking about the brand in of itself, and start thinking about the people who represent that brand? In other words, if the people can’t be trusted who are behind the brand, how can we trust the brand itself? WALLACE: Exactly. Everything a brand has done and is doing is part of your brand. Patagonia is an example of a brand that is high minded, innovative, quality-oriented, transparent and sincere. DUPONT: In The Physics of Brand, you and the other two authors speak of a brand’s “energy.” Do you feel that brands become living entities — they have their own energy and spirit — and like human beings, they go through a life process and experience life changes, from moments of loss or moments of being lost to moments of clarity and moments of purposefulness? WALLACE: I like your description here. Before the industrial revolution, brands were people, church or state. In the English language, early commercial brand names included Farmer, Butcher, Baker, Brewer and Barber. Trains and factories separated us from belly-to-belly, face-to-face contact with the people behind the products and services we buy. The challenge is that our DNA has prepared us to relate to people, not packages on shelves or pages on websites. DUPONT: In the world of marketing, brand messages are frequently being delivered through digital media. How do you feel digital media has affected brands for better or worse? WALLACE: I think the Internet has been great for customers and for challenger brands. The Internet has made it harder for legacy brands. Most customer journeys begin online these days, and increasingly people are also buying online. The information asymmetry brands enjoyed in the past is gone today. DUPONT: In the 1999 book, The Cluetrain Manifesto (http://www.cluetrain.com), the authors frame up the new age of digital on this premise: “Markets are conversations.” Are brands actually conversations? They’re not something imposed on one person by another person, but a jointly held idea or narrative that evolves over time? WALLACE: Well put. The Cluetrain Manifesto was prophetic. However, I think people want transparency, sincerity and accessibility to brands more than a conversation. A brand is a legal fiction, and it is impossible to have a real conversation with a disembodied entity. To take your statement a step farther, our minds are dominated by all kinds of entities in our collective imagination. The natural world does not produce law, government, news, entertainment or brands. We do. DUPONT: Venture capitalists, investment bankers, etc., are keen on understanding the monetary value of a brand. When someone starts a company and begins the branding process, when does “value” come into play? Does it begin at the moment of the first purchase? WALLACE: Brand value begins with the first memorable moment, and you only have one chance to make a good first impression. Brands live and die in neurons. It’s important that the social and economic value of the new offering is readily apparent and well positioned. Economic brand value is achieved largely through a combination of fast growth and profit. WALLACE: Consistent quality is the key. While consistent quality is key, a legacy brand also needs to keep innovating and adding new value. The Cheerios website currently shows 14 different varieties of Cheerios. These varieties come in many different types of packages and are distributed through many different channels. All brands, personal or corporate, need both consistency and variety. DUPONT: In the section, Space Food? That’s Crazy, you and your co-authors note, “The package design sent signals of quality fruits and vegetables in an easy-to-open and handle pouch (referring to Plum organic foods).” Do brands need to send signals out, as in a conversation, like humans sending body signals back and forth as part of a conversation? WALLACE: The best communication feels like a conversation, yet most signals are subconscious and non-verbal. This is why experience design is becoming so important. It was readily apparent to a busy mom that Plum organics could satisfy a fussy child with healthy food — right there in a grocery store at the moment of truth. The package itself communicated the value proposition. DUPONT: In the book, you note, “brands are built one person at a time. Same as relationships.” I’ve noticed in my experiences over the last few years that more and more organizations want to spend less and less time on actual human contact between the people behind a brand and consumers. Digital marketing and social media has accelerated this, I think. WALLACE: This is a big problem. The best brands personally understand the customers who use their products. Ideally the brand managers are also true customers of the brand. Third party research cannot make up for an empathetic understanding of the customer. If you really understand the problems your customers are trying to solve, you can lead them to new solutions. DUPONT: Some brands have been brought back to life based on the good memories of previous customers. Examples: the Ford Mustang, Quaker Oats’ Quisp cereal, etc. When a product ceases to exist, but the brand still exists in the heads and hearts of a consumer, what value does a brand offer to a person other than a pleasant memory or a positive story (example: stories about driving around in a Ford Mustang when I was “younger”)? WALLACE: Positive memories are the hidden reservoir of brand value. We define a brand as a vehicle of trust, fueled by experiences. If people have spent a lot of time in sensory space with a brand, and if those experiences lead to positive memories, the brand has energy. When that energy is combined with innovation, great things can happen. Our Time, Space and Jacob’s Ladder models show how brand value is created. DUPONT: When an organization wants to build a brand from scratch or refocus a brand, what inputs should an organization gather to understand if it is correctly positioning a brand for success? WALLACE: It all depends on the situation. My co-authors and I believe that every brand is uniquely situated and that brand value depends on different factors for every brand. That said, I’d start by investing time visiting with customers in their spaces, asking them questions, trying to understand the problems they are trying to solve, and then developing sets of open-ended questions to guide your imagination. I learned about this approach when I met innovation award recipients at a 3M event. Nothing beats empathy and a desire to help others. DUPONT: How important is it for an organization to have actual conversations (face-to-face, phone, etc.) with its brand stakeholders about perceptions of the brand and if and how a brand is delivering value? How often should those conversations occur? WALLACE: It is critical to do this and you should do it as often as possible. Depending on focus groups and quantitative research won’t help you understand the hearts, subconscious drives and physical environment of customers. You have to get out there in the real world. DUPONT: How important is trust in building and maintaining a brand? WALLACE: It’s all about trust. This is the foundation of a brand. The way to gain trust is to provide dependable social and economic value, state that value appropriately, and then make your brand mentally available and physically available. DUPONT: There is the distinct Coke bottle (as noted in your book). There is the distinct Harley-Davidson muffler sound. There is the distinct taste of a Big Mac. How important is it for brands to consider our senses in the “design” of products and services? WALLACE: The contents of our consciousness come through our experiences in time and space, so sensory inputs are vital. We experience brands through our senses and value them with time. DUPONT: There are many marketers employed at B2B manufacturers and processors, where the purchase of a product or service is based on lowest cost of ownership or lowest bid. How do suppliers build brands where the purchaser essentially cares about just two things — price and lowering a company’s cost of ownership? WALLACE: In B2B, price is the word salespeople hear most often. What they don’t hear about as often is quality, but quality is always top of mind as well. Value is the relationship between price and quality, and there are many ways to improve quality. One of the most important dimensions to look at in B2B is time. Ask yourself: How can you save your customers’ time and improve the quality of customers’ time? There is also an opportunity to turn a commodity into a finished good or a service. The bigger problem is not asking the right questions and limiting your imagination. We human beings are wired to focus on problems 2:1 over opportunities, so it takes effort and outside influences to break free of limiting mindsets. DUPONT: Thank you Dan for sharing your insights. Stephen Dupont, APR, is VP of Public Relations and Branded Content for Pocket Hercules (www.pockethercules.com), an advertising, public relations, digital brand marketing firm based in Minneapolis. Contact Stephen Dupont at www.linkedin.com/in/stephendupont or visit stephendupont.co.